You can change the size of your slides in the presentation settings. There's a number of preset sizes to pick from, or you can specify your own. All sizes are defined in pixels. The selected size determines the aspect ratio of your content. Regardless of what size you select, the presentation will still work on any display. 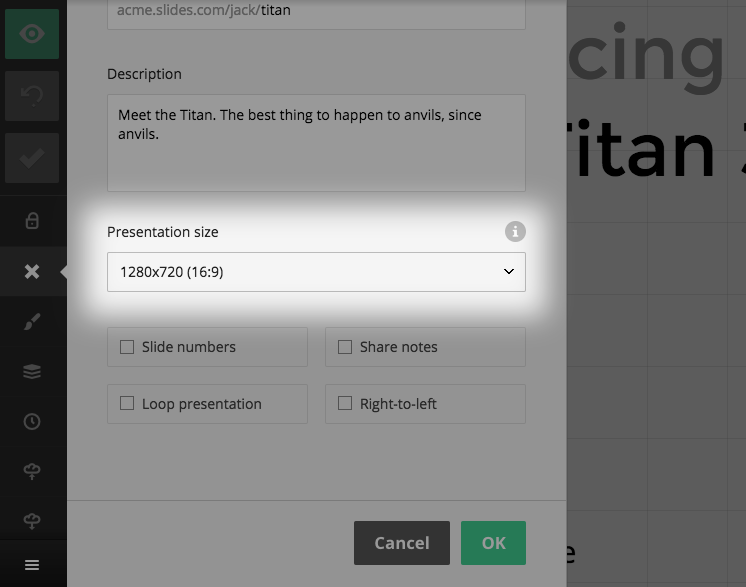 If you're using Slides for Teams you can specify a presentation size in the theme editor. This theme size will be used by all team members when they create a new deck. This is where your slide content such as text and images live. Content is scaled to be as large as possible without affecting your original layout. This is the layer behind your content which displays the slide background color or image. The background is more flexible and scales to cover 100% of the width and height of the display to avoid letterboxing. Learn more about slide backgrounds. Here's a visualization showing how these two layers come together to make the best use of available space. The tiled images represent the background layer and the light "SLIDE CONTENT" box represents the content.